I’ve got a few book reviews to hack together, and a few movies to rant about. For the moment though, I’m going to make myself a pumpkin latte and watch the torrential downpour and listen to the astonishingly insistent thunderstorm that is crashing outside the shop where I work. Just lovely. Taking the Readers Imbibing Peril quite literally, eh? I like it. I’ve not read the poem in a while. Perhaps I should. “The Bells” has always been my favorite Poe poem. I’ll definitely be checking out ‘The Bells’. If the rest of Poe’s poetry is as fun as ‘The Raven’, I’m surely in for a good time! A pumpkin latte sounds like a great idea! Ooo, ‘The Highwayman”! I had that memorized for a long time, set to the music of Loreena McKennit I believe. What a great ballad – I wonder if anyone has novelized it effectively? I’m a sucker for such things… Why waste my time looking though when I could just read the poem again – off to do so. Have you read his essay “The Philosophy of Composition,” where he claims to “explain” the poem? It’s quite funny, in a subtly mocking way. He was obviously having a laugh on all those people who saw “Raven” as some sort of personal soul-baring of his. Darn, that piece isn’t in my “Portable Poe”. I’ll have to track it down – seems like a very suitable companion read. Thanks for the tip! Sweet! Thanks Undine, I’ll check it out. No worries, there are many more great beers out there for me. 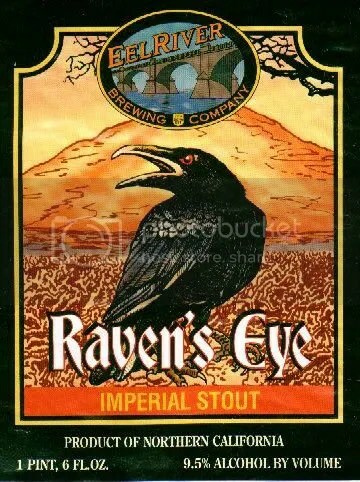 Maybe that Raven’s Eye addled my brain though, because I’ve been obsessively thinking about what kind of nut would have trained a raven to say “Nevermore” and then cackling to myself over the gloomy hilarity of the idea…! Ooo, thanks for the link. I love that Poe pint glass! I haven’t seen this at my local beer stores, but I can ask around. Thanks for the tip. I’ll check back at your blog come January – your reading endeavor should be fun!